Life rarely unravels as expected. There are almost always unexpected turns that could be for the good - or the bad. That's why it is vital to get the assistance of a proven Wills and Estates lawyer when it is time to write or update your Will. You also need to consider what happens if you become incapacitated? Who will handle your financial matters and make decisions about your healthcare? You can make your desires known by setting up a Power of Attorney (finance) and Personal Directive (health). Think twice before trying to write your own Will or, worse still, using a "free" Will Completion Form that you found on the internet. Wills written without the help of a skilled Wills & Estates lawyer are almost always incomplete and/or include provisions that are so contradictory that they are not enforceable. You may not be aware that there is more than one kind of Will. For example, do you know the difference between a conventional Will and a Holograph Will? It is possible to amend or revoke a Will. But, once again, there are specific steps that must be taken to ensure the change is recognized by the Courts. Learn more by reviewing the following definitions of key terms commonly used in Wills and Estates documents. Note that for your benefit we have used simple language in place of the actual legal ease - just one more example of our ongoing effort to make the legal system more comprehensible for the average person. Will: a legal document that describes how you want your estate divided between specific beneficiaries. Careful writing of the Will ensures that either part or all of the Will can't be successfully challenged by a beneficiary or someone not named in the Will. Holograph Will: A Will that is completed in hand writing, typically without the help of a Wills & Estates lawyer. There are legal requirements for a Holograph Will. For example, a Holograph Will becomes invalid if it contains any typed content. Estate: Property owned by a person at the time of their death. This property could be in or outside the province of Alberta. Executor: The person you entrust with the responsibility of ensuring your wishes are followed when your Will is executed. The work performed by this individual includes three major steps: collecting all your assets, paying off any debts, distributing the renaming assets according to the terms of your Will. Administrator: the person who manages the distribution of your estate if there is no named Executor or that person cannot fulfill his or her duties. Intestate: A person who dies without a written will and hence has no say in how his or her estate is disbursed. Instead, the property division is based on rules that govern the distribution of assets to a surviving spouse, interdependent adult or children. Personal Directive: A legal document that designates an individual who will make decisions about your health, living circumstances and healthcare when you are incapacitated. It is only enforceable if it is in writing and has been witnessed properly. 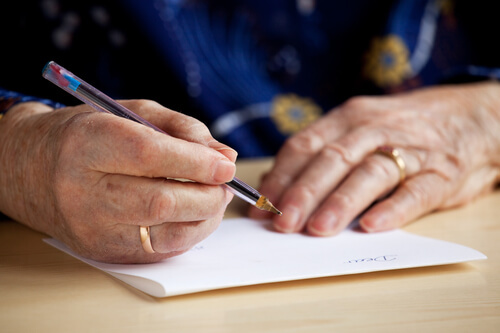 Enduring Power of Attorney: A legal document, also known as Springing Power of Attorney that designates an individual who will make decisions about your financial affairs when you are incapacitated. It is only enforceable if it is in writing and has been executed properly. "Thanks for your awesome help."